The controversy queen Veena Malik has caught several times smoking and drinking publically before her marriage, after Lollywood, she has also worked in Bollywood. Mahira Khan who is the top VJ, actress and model in Pakistani media industry, has also caught smoking in 2017 in the leaked image with Bollywood actor Ranbir Kapoor. In the beginning of 2016, one of her leaked video with Fawad Khan also gone viral when she told Fawad khan during the interview that “She wanna smoke”, off camera in a chat show named “TUC The Lighter Side Of Life”. 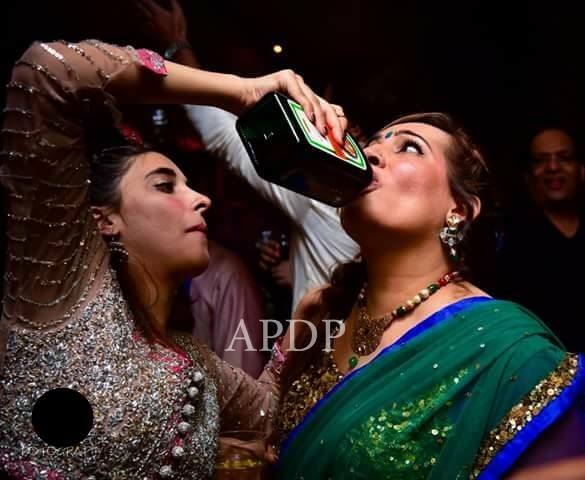 Leading Pakistani actress, VJ and model Urwa Hocane has also seen drinking in a private party where she drank and dance in viral video. Humaima Malik also a Pakistani actress and model that got controversial for her smoking pictures. Drama and movie actress Ayesha Khan is also known for smoking habits. Nausheen Shah, a Paksitani acturess and model has also seen smoking at private occasions as a chain smoker. Sana Tariq, who is popular TV anchor in Pakistan also smoked in pictures, which gone viral on social media. Sanam Baloch is also known for her smoking habits. Meera Sethi who is known as journalist, actor and the daughter of popular Pakistani journalist, anchor and chairman of Pakistan Cricket Board (PCB), Najam Sethi, also caught smoking. Amna Ilyas who is super model and actress, also a chain smoker and seen smoking several times on and off camera. Along with several controversies, the top former model Ayyan Ali is also known to be the female chain smoker in the Pakistani industry.